The Westgate is fast becoming one of the most popular areas of the city, and for good reason. The new development has seen an influx of locals and tourists flocking to the area and there’s been a sharp increase in tourism too. 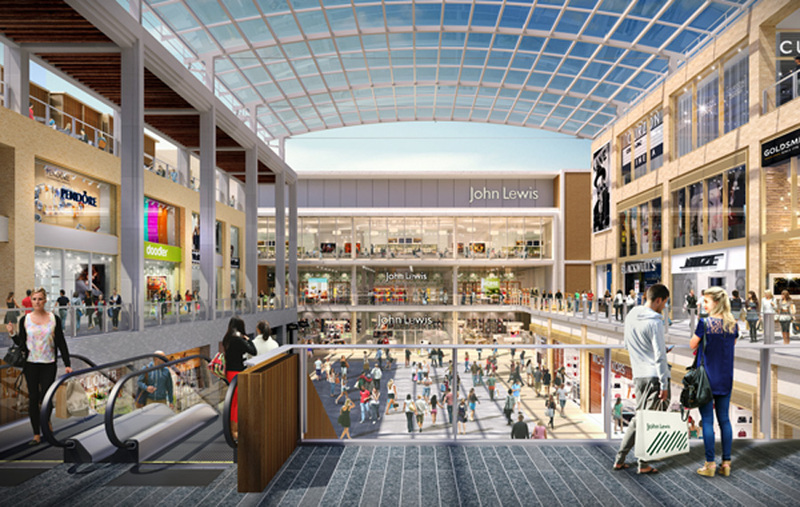 As well as being home to the hottest shops and restaurants, the Westgate also boasts a number of bars, a cinema and an indoor mini golf course. 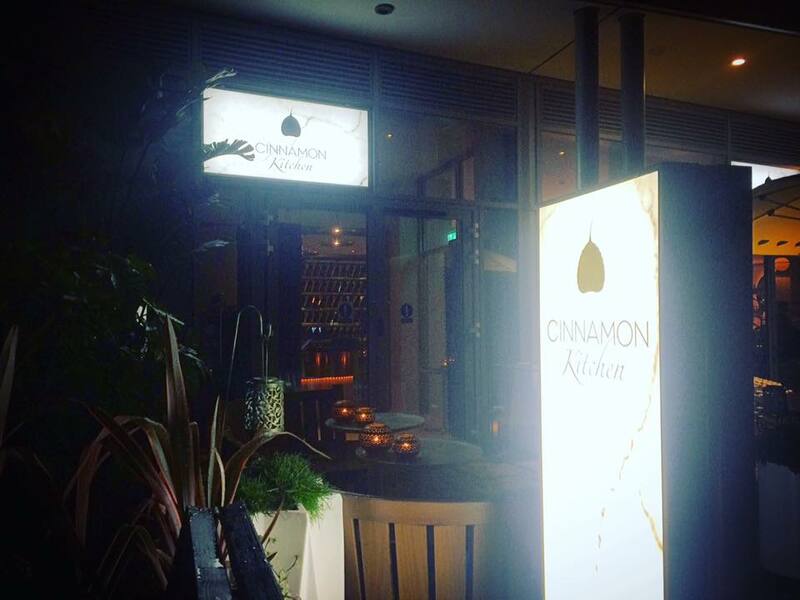 Cinnamon Kitchen is perched right on the rooftop, next to a row of trendy restaurants including a sushi place and acclaimed cocktail bar The Alchemist too. 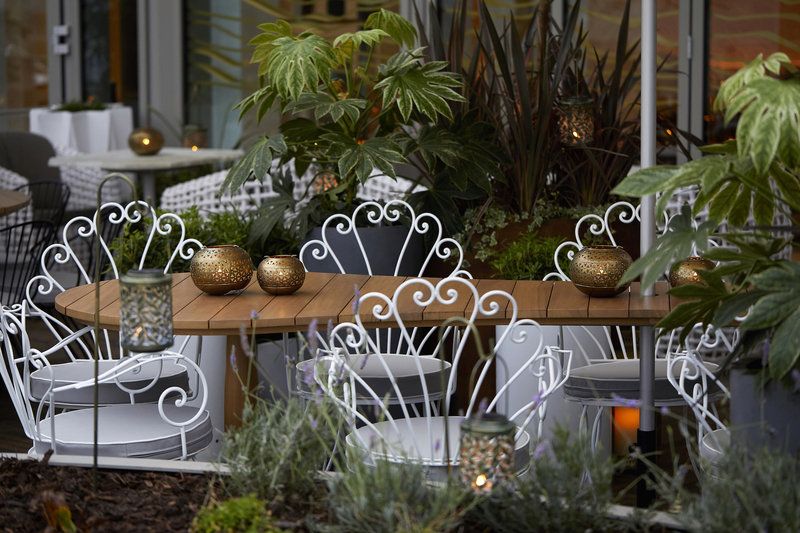 Cinnamon’s stylish exterior fits right in with the Westgate’s designer theme and the outdoor garden with trees, plants and seating area (which will be amazing in summer) make it feel like a mini jungle right in the heart of Oxford. This place looks just as good on the inside as it does from the outside, with incredible attention to detail and glamorous décor. 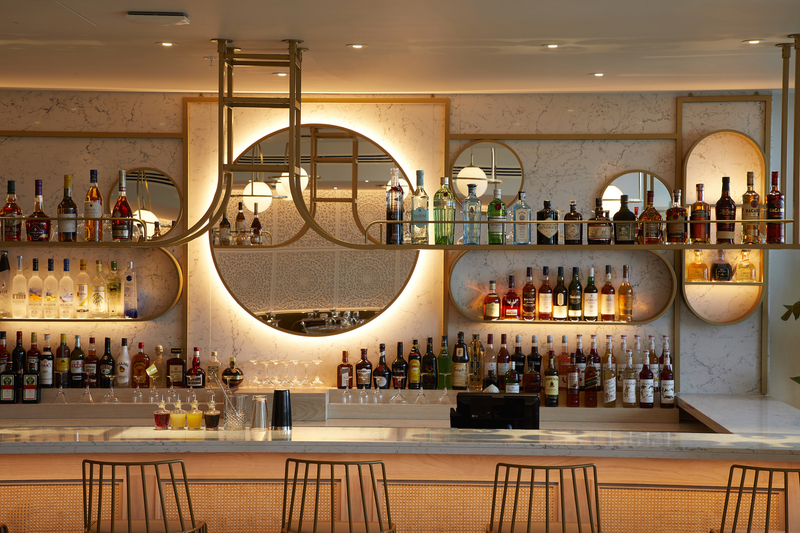 The bar is decorated with gold mirrors and reflective white lighting, whilst the dining areas are complete with smooth furniture, vibrant wall art and crisp clean walls. Although not overly big inside, it feels like there is plenty of space between tables and there’s a private dining area too for those looking to dine in peace. There is a ‘show-cooking’ Tandoori grill next to the kitchen, allowing guests to see and smell their food before it arrives at their table, and this really adds to the authentic Indian fine dining experience. 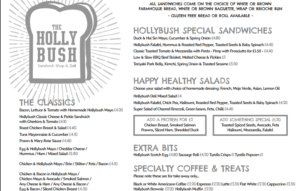 We were asked to choose from the lunch time set menu, so I can’t comment on the rest of the menu’s on offer, but our choice of food was exquisite and I’d highly recommend it to anyone looking for something different to their usual lunch time routine. Starters to choose from included chicken skewers. smoked haddock and vegetable pastries. 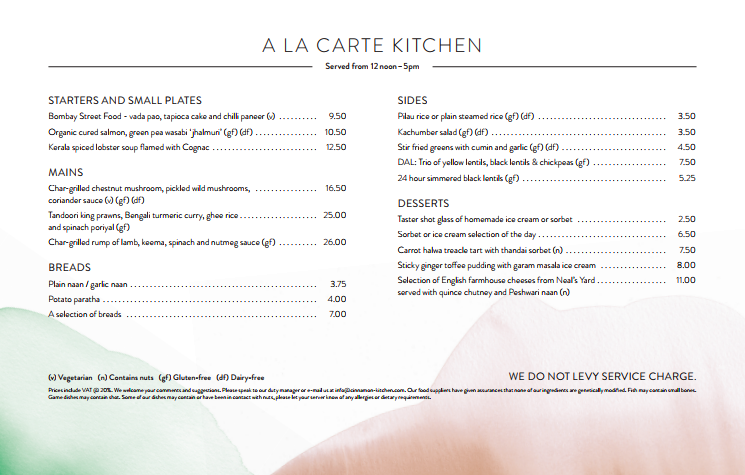 For mains you could opt for a butter chicken curry, char grilled sea bass or spiced veal kebab. 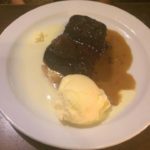 Desserts could either be in the form of a carrot treacle tart, ginger toffee pudding or sorbet of the day. Our set lunch menu was priced at £21pp for two courses, or £24pp for three courses which I do think is a little on the steep side for lunch, but is well worth the money if you wanted to treat yourself. 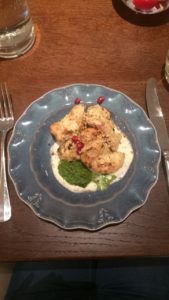 To start, my friend and I both chose the chicken skewers with rose petals, pomegranate and toasted buckwheat which was every inch as good as it sounds, and looked super pretty on the plate too! The rose petal and pomegranate sauce made the perfect dressing with both complementing each other perfectly, whilst the chicken was incredibly soft, tender and tasty too. For mains my friend and I opted for the same again, both choosing a rich butter chicken dish with rice, naan bread and a trio of dahl. Although a little spicy for both our liking (we are such wimps!) the dish was great and super tasty. The trio of dahl really helped with the spiciness and the flavours were amazing. 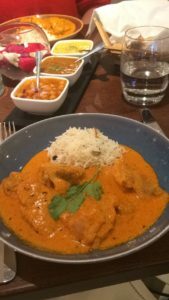 We both agreed that the extra side plate of naan bread was the best we had ever tasted – super soft, flavoursome bread with cheese all the way through the middle – and we were well and truly full up by the end. For dessert we were treated to a medley of puds as we couldn’t decide what to have and weren’t even sure we could manage to eat anything else! Katherine and I soon devoured miniature tarts, cakes and pannacotta when it arrived though and it was the perfect way to cleanse our pallets and end a wonderful dining experience. Throughout our lunch we were looked after by our waiters Andreas and Rohit who were both fantastic and couldn’t do enough for us. Andreas in particular was so attentive, well-mannered and super friendly. They both made sure we were treated like royalty and made our experience that extra bit special. I met with general manager Leon towards the end of the lunch and it was lovely to gain an insight into how well the restaurant is doing – he told us that they had 60 guests booked in for dinner that night and that they had been busy all week! I’m a firm believer that the staff are the beating heart, life and soul of any business and it is certainly true in this case. Cinnamon wouldn’t be what it is today without their wonderful employees who work tirelessly to ensure every guest leaves full, happy and feeling special. As you can see, my friend Katherine and I had the most wonderful afternoon at Cinnamon and we left with our bellies full and our taste-buds satisfied. 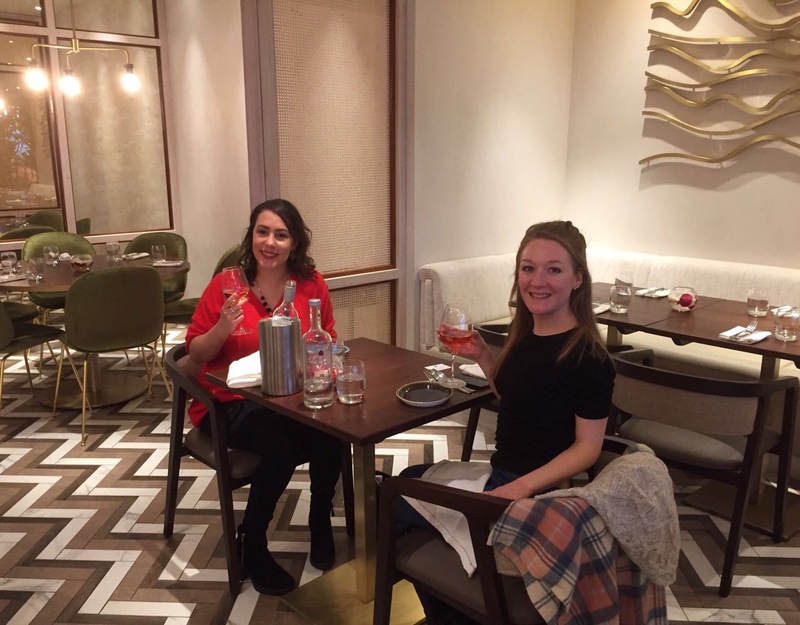 The ambience was lively, the staff were wonderful, the food was exquisite and the location was perfect, although I’m sure the rooftop would have been better had it not been so cold out! 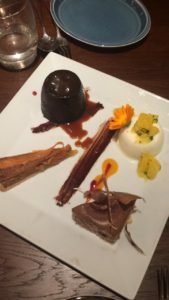 I would highly recommend Cinnamon Kitchen Westgate Oxford for anyone looking for an authentic Indian fine dining experience, for either an afternoon lunch time treat or an evening occasion. Big thanks must go to all the wonderful staff who helped make our afternoon so special! NB. 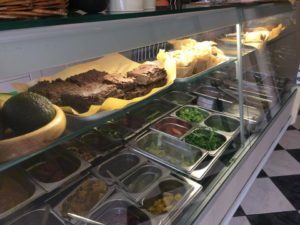 I was a guest of Cinnamon’s for the purpose of this review, but all thoughts are of course my own. Katherine and I enjoying our day out! 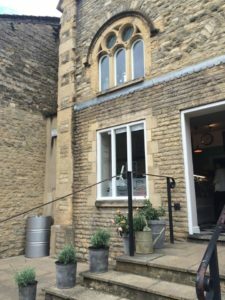 A couple of weeks ago I was contacted by a local PR company, the same one that asked me to review The Perch at Oxford, asking me to review yet another local Oxfordshire restaurant. 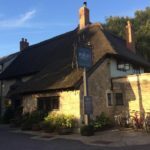 I said yes (obviously) and headed over to The Fox Inn, located in the sleepy little Cotswolds village of Great Barrington, just past Burford, on a sunny Tuesday evening with one of my best friends. 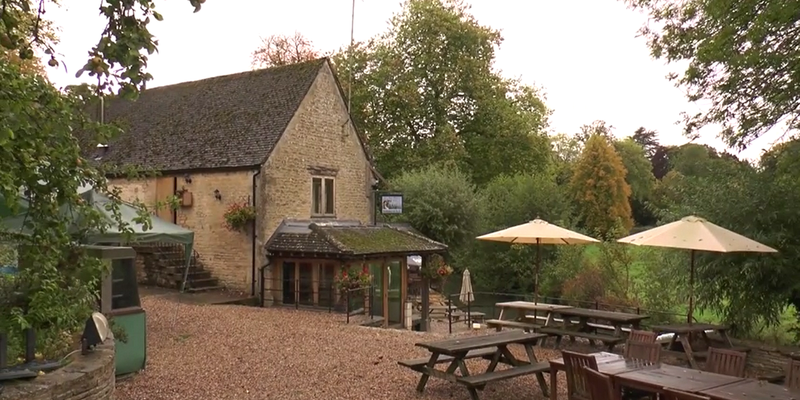 The Fox Inn has been serving ale drinkers and food lovers for many, many years and it’s gorgeous riverside setting with large garden attracts tourists and locals alike. 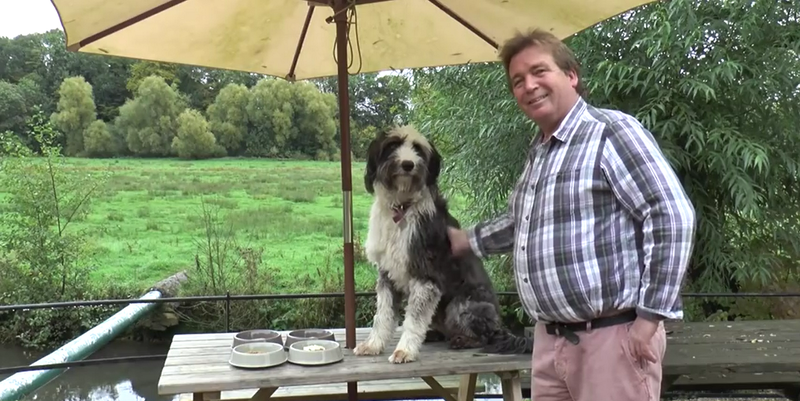 The pub is particularly popular with dog walkers, due to it’s fantastic location near the River Windrush and some of Oxfordshire best footpaths and bridleways, making it the perfect place to stop off and relax whilst enjoying a drink or a bite to eat in the most comfortable of surroundings. The Fox even caters for your canine friends with a unique Dining with your Dog Menu so your pooch will be just as satisfied as you are whilst you’re devouring your Sunday lunches! Upon arrival we were greeted by bar manager Summer who looked after us during the course of the evening too. Summer was brilliant, she was super smiley, friendly and helpful and was attentive when asking our orders. 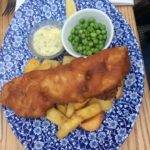 The menu was eclectic with a number of options to suit every taste bud; diners could choose from hearty pub grub dishes including beef stroganoff, chicken curry, fish and chips or homemade pie. The starter menu was plentiful, as was the ploughman’s lunch menu which we will definitely return to try one day! We both skipped starters but opted for the crispy duck and bacon salad (£16.50) and the mega knuckle of Cotswold lamb (£22.95) for our mains. Both dishes were served promptly and both were truly delicious! 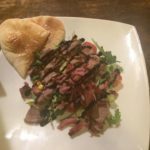 The sticky balsamic dressing and hot pitta bread really complemented my crispy duck and bacon salad, whilst my friend said her slow cooked, melt in the mouth lamb went perfectly with the rosemary sautéed potatoes and fresh vegetables that came with the dish. 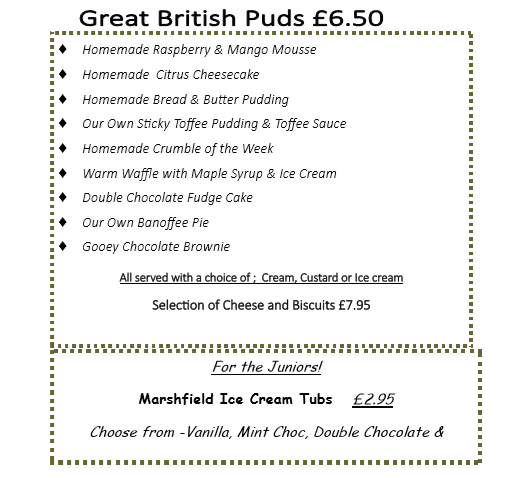 The dessert menu was varied and offered a number of different delights for adults and a smaller ice cream menu for the kids too. 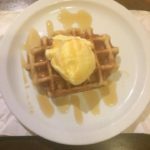 We chose the waffle with maple syrup and ice cream and the sticky toffee pudding and toffee sauce; both puds were A-MA-ZING and I could’ve devoured both of them all in one go! Overall we had a fantastic evening out at The Fox and will look to return with my little westie dog in the winter months.. I’m sure the Dog Menu will be a hit with her, and with us! The roaring fire will make this Cotswolds gem even more cosy and I’m looking forward to seeing what yummy dishes the winter menu promises! A big thanks again to Summer for looking after us – we will be back! 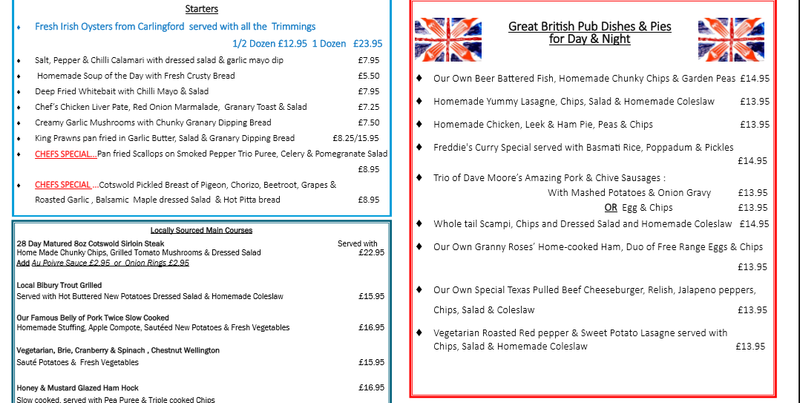 To book an evening, weekend, dinner or lunchtime meal at The Fox Inn please contact the pub directly. NB. Thank you to Crimson PR & The Fox for sponsoring my visit. All views and opinions are my own. 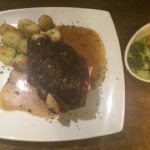 A couple of weeks ago I was contacted by a local PR company asking me to review a fantastic local Oxfordshire restaurant, of which I was only too happy to oblige! 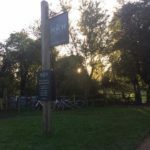 I was asked to head to The Perch just off the Botley Road in Oxford and we’d booked a table on a busy Sunday evening on one of the hottest September days on record! 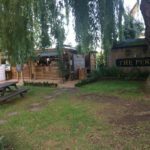 The Perch is one of the oldest pubs in Oxford, located just outside the busy city centre in Botley, and just a few minutes walk from the River Isis and pretty Port Meadow. Despite it’s central location, you’d be forgiven for thinking you’d stumbled upon a country pub with it’s quaint riverside setting and stunning gardens. The interior décor of the pub is rustic but with a modern feel and the outside bar, patio area and secret garden, with walk-through arches and fairy lights, adds to the beauty of the site. Upon arrival we were greeted by Maddie and Ben who looked after us for the rest of the evening. The menu’s presented to us were varied and offered something for every taste bud. Between the five of us we were served bread and oils to start and opted for Blythburg free-range pork belly (£15.95), ale battered Cornish fish and chips (£13.75) and the chargrilled 8oz burger (£13.75) for mains. 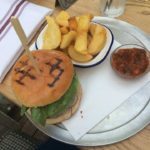 The food was served promptly and was truly delicious; every mouthful of my burger was tender and perfectly complemented by the bacon, tomato relish and farmhouse cheddar cheese with triple cooked chips just the way I like them! 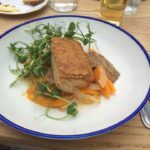 The pork belly and fish and chips received excellent feedback too – all were cooked to perfection and served with the perfect accompaniments; scrumpy braised carrots with crackling and pear mustard for the pork, and tartare sauce and minted peas for the fish. The dessert menu was full of summery options including sorbet’s and posset’s; we chose the frozen raspberry ripple parfait (£6.25) and were pleasantly surprised! The white chocolate cream and hazelnut praline was a lovely pairing and the whole dessert tasted fantastic. 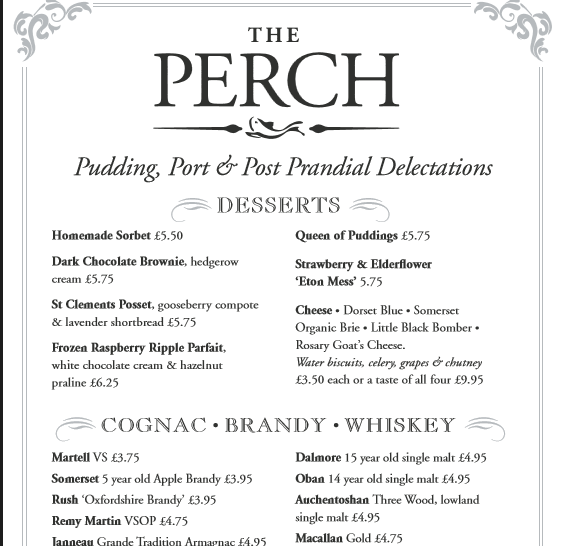 Overall we had a wonderful evening out at The Perch and will certainly be returning in the winter months! I’m looking forward to sitting by the roaring fire and soaking up the cosy Cotswolds atmosphere! 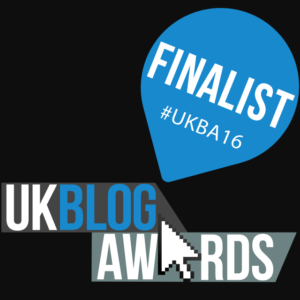 A big thanks again to Maddie and Ben for looking after us – we will be back! 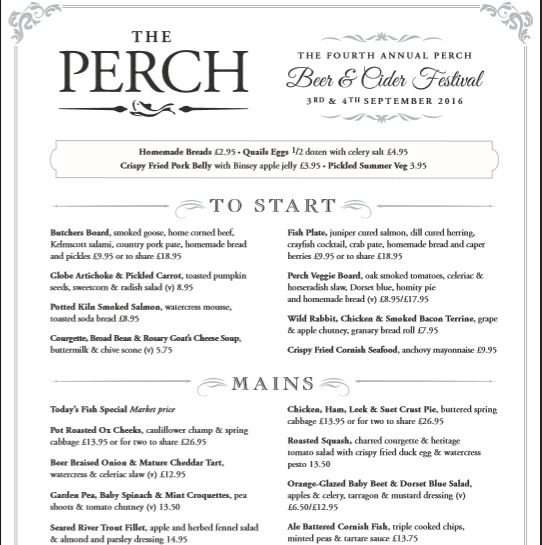 To book an evening, weekend, dinner or lunchtime meal at The Perch please contact the pub directly. NB. Thank you to Crimson PR & The Perch for sponsoring my visit. All views and opinions are my own. Upon arrival we were greeted by the lovely Jonathan, one of the waiters who looked after us for most of the day. We were shown to our table, or in this case, an exclusive lounge on the first floor of the dining room where we were made to feel like true VIP’s for the day. With quirky antique tables and chairs and large windows as well as a balcony overlooking the rest of the dining room, our executive lounge made the perfect place from which to enjoy our Royal Afternoon Tea. Shortly after we were seated, and had finished gazing in awe at our new surroundings, we were shown the menus by Jonathan and were able to select our teas. There was a wide range of teas from traditional English breakfast to raspberry, rooibos and even chocolate flavoured. We both chose the strawberry and mango infused tea which was brought to our table in a cute little teapot with cups and saucers. 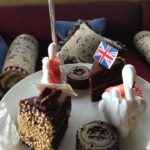 We then ordered the Royal Afternoon Tea for two which was brought to us promptly. Hannah and I couldn’t believe our eyes when the afternoon tea arrived, there was literally SO. MUCH. FOOD! 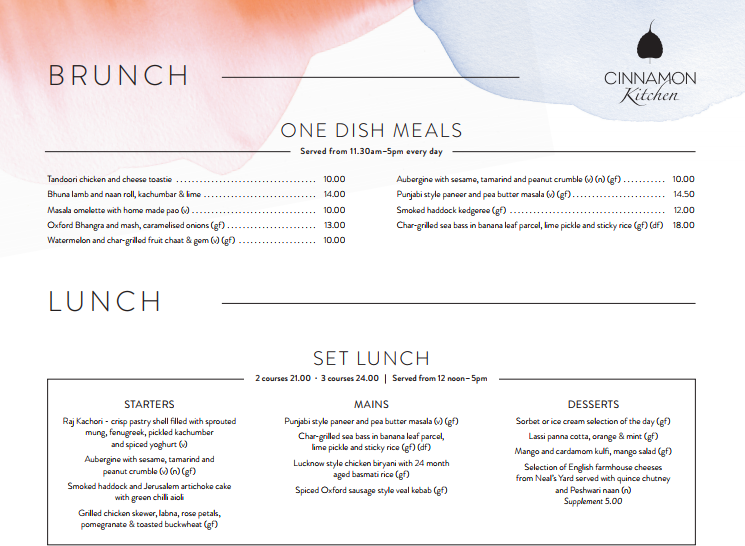 The menu, by executive head chef David Kelman, boasted three tiers of sumptuous goodies including sandwiches, scones, cakes and sweet treats. 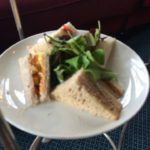 The bottom tier comprised of a range of sandwiches including honey roast ham with Tewkesbury mustard, smoked salmon, egg mayonnaise with cress and cucumber with tomato and spicy relish. We actually swapped the smoked salmon sandwiches for cheese and pickle ones as we aren’t huge fans of salmon but we both love our cheese! 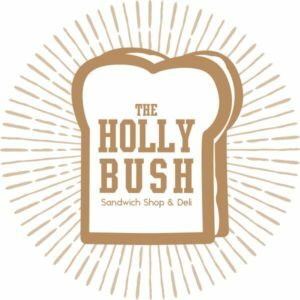 The sandwiches were perfectly cut, neatly filled and incredibly tasty. 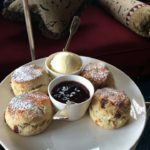 The middle tier was home to freshly baked Ellenborough Park fruit scones with jam and clotted cream. The scones were fresh out the oven and were still warm so the jam and cream set on the top just nicely and were mouth-wateringly good! Finally, the top tier showcased some of the most fantastic dessert pieces I have ever seen. We were treated to meringue swans filled with fresh strawberries (they were GENIUS!) and Her Majesty’s favourite chocolate cake with white chocolate flag which was truly scrumptious. There was also a salted caramel Tudor rose chocolate which was incredibly rich as well as Her Majesty’s passionfruit hat, a passionfruit mousse set on a biscuit base with passionfruit glaze and edible sugar flowers which was a delight! Hannah and I devoured almost everything on each tier and were fit to burst by the time we had finished! We thoroughly enjoyed each and every aspect of the afternoon tea and there was no item on the menu which wasn’t expertly made or presented. The 5 star surroundings added to the luxurious atmosphere and it was certainly a dining experience to remember. With its stunning buildings and sprawling grounds, Ellenborough Park prides itself on “providing guests with the finest hotel accommodation and service in the Cotswolds.” You’ll find 60 large bedrooms and suites as well as two on-site restaurants lead by award winning executive head chef David Kelman. Facilities include an impressive Indian-themed spa and a 15m heated outdoor swimming pool whilst other leisure activities within the hotel grounds can also be arranged. To celebrate all things British and enjoy a quintessentially English dining experience book your table at Ellenborough Park today! 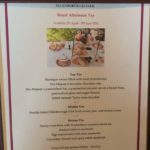 Royal Afternoon Tea is priced at £22pp Monday – Thursday or £25pp Friday-Sunday. 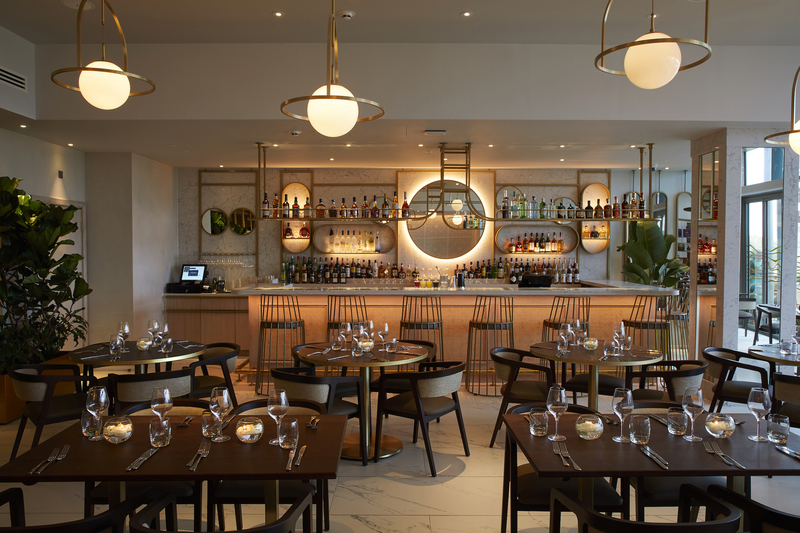 An optional glass of Champagne Billecart-Salmon can be added for an extra £12pp. To book, please call the hotel directly on 01242 545454 or email info@ellenboroughpark.com. Thank you to all at Ellenborough Park for looking after us and for giving us such a wonderful afternoon – I cannot recommend the hotel highly enough and I will certainly be back! NB. I dined with Ellenborough Park as a guest for the purpose of this review but all views are my own.